Heat olive oil over medium heat in a heavy bottomed large dutch oven or stockpot. Add in the chopped onions and cook for about 7-10 minutes or until translucent. Add in the carrot and garlic giving it a good stir for about 30 seconds or until garlic is fragrant. Add in the lentils, cumin and smoked paprika, stir for a few seconds then add in the 6 cups of prepared bouillon water OR vegetable broth. Bring to a boil then reduce heat to a simmer, cover and allow to simmer for about 30 minutes or until the lentils are soft, stirring and checking in from time to time. *SEE FOOTNOTE* Taste for salt and add as necessary. As VeggieBelly suggested, you can garnish with chopped cilantro or parsley or red chili flakes and some crusty bread or pita on the side. Footnotes: I’m a huge fan of mincing garlic through a garlic press and most of my recipes call for this type of process. However, there are a few times when mincing it will give it a different taste profile. I strongly feel that this soup requires a finely chopped garlic, not pressing. If you decide to press anyway, you may want to use less since pressed garlic is typically stronger in taste. I have stopped using boxed vegetable broth because I found something way better. I recently discovered Better Than Bouillon brand that is out of this world awesome! Not only is it low sodium and no MSG but it is also organic. They have quite a few varieties so you have to be mindful to get this exact one I am so in love with. I order it on Amazon because this one is hard to find. It is the Better Than Bouillon Vegetable Base – Low Sodium -Organic. 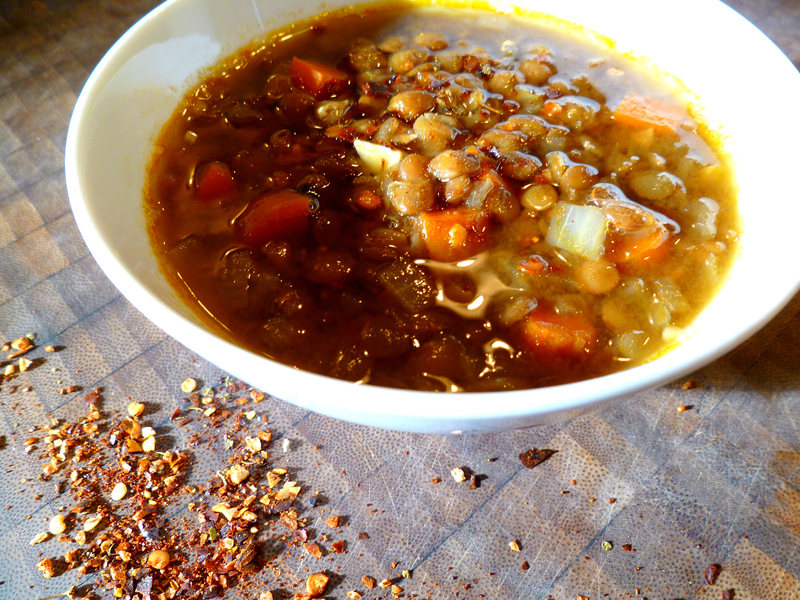 It really packs in the flavor so I find I usually need less than what is called for… like in this recipe I only had to use 2 tsp being I had other spices in the soup and I didn’t want to overpower the authentic flavor. If you don’t have this or another tasty bouillon you like, just use your favorite vegetable broth or stock instead of the water and bouillon. Different lentils and/or older lentils may take longer than others so it could be a bit faster or even 15-20 minutes longer depending on varying circumstances including altitude. Make sure to check on the soup from time to time to stir. Also, if you find the soup is getting too thick, feel free to add more water. I have a super fantastic Staub Dutch Oven so I experience very little evaporation and mine turns out very brothy. But this is a versatile soup, make it as thick or brothy as you like. I prefer mine with more of a broth base. If you do end up adding in more water, you may need a touch more of cumin and/or bouillon. Just taste and adjust as necessary. This is super simple and very versatile! This looks fantastic! And I agree, simple, hearty soups can be so satisfying! Mmm, I love soup season! This one sounds (and looks) fantastic–the smoked paprika sounds like a great addition. Have you ever tried Rapinzel bouillon cubes? Those are my favorite when I don’t have frozen broth on hand. No I haven’t tried the Rapinzel cubes. Where do you get them? I’ll check it out. Love Amazon! Oooh, it looks so comforting and lovely.